The Russian president spoke about Ukraine, Crimea and Russia’s relations with the West and even answered a question from Edward Snowden. 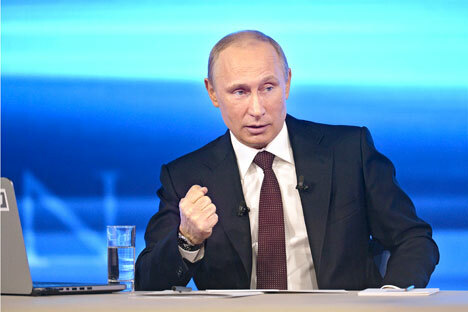 Russian President Vladimir Putin answered questions from citizens and experts on live television yesterday. Most of the questions concerned the country’s relations with Ukraine. The surprise of the day was a question from former CIA contractor Edward Snowden about the probability of the Russian government spying on its citizens. The event lasted nearly four hours, during which time Putin answered more than 70 questions. The president believes that there was an unconstitutional coup and armed seizure of power in Ukraine. The Russian leader categorically denied all accusations of Russian troops taking part in the events currently occurring in eastern Ukraine. Putin considers it extremely important that an early dialogue be started between the current Ukrainian authorities and the regions of that country. He stressed that Russia has always been close to Ukraine, saying that financial aid provided to the country has already reached hundreds of billions of dollars. As for the issue of Crimea and Sevastopol, according to the president, this was clearly decided by the outcome of the referendum on the peninsula. Russia never planned taking any military action in Crimea, and was ready to build relationships in the current geopolitical realities, but was forced to act as result of real threats to the Russian-speaking population. “The threats against Russians and Russian-speakers were concrete and tangible. This prompted the people to think about the future of Crimea, and turn to Russia for help,” said the president. Putin reiterated that Russia considers the currently established government in Ukraine as illegitimate. Despite this, the Russian side is not refusing from engaging in dialogue. Putin is ready to work with all parties in the elections in Ukraine. How can the crisis in Ukraine be de-escalated? Putin hopes that he will not have to use his right to send troops into Ukraine. The Russian parliament has given the leader this permission. “I really hope that I do not have to exercise this right, and that political and diplomatic means will be able to solve allthe sharp, if not the most acute problems of the day, in Ukraine,” said Putin. Having discussed the reunification of Crimea with Russia, some people decided to ask the president about another region with Russian history – Alaska. The president responded with a laugh: “Why do you want Alaska?” Putin said that Alaska was sold in the 19th century. “Russia is a northern country, with 70 percent of its territory belonging to the North and the Far North. He also noted that supporting such regions is difficult on the state budget. Putin is hoping for a successful resolution of the problem with the transit of gas through Ukraine. The Russian leader is convinced that Europe cannot refuse from buying Russian gas: 30-35 percent of Europe’s gas needs are supplied from Russia, just in Finland, this share is about 90 percent, while in some other countries it is 60-70 percent. Russia is willing to wait another month for Ukraine to pay its debts for gas, and has asked the West to join the process seeking a solution to this problem, said the Russian leader. On relations with the U.S.
Moscow wants to regain trust in relations with Washington, the Russian leader noted, and urged the U.S. to rid world politics of lies and double standards. “We need to take into account the interests of each other, to speak the same language, get rid of the international policy of double standards and lies, and pay more attention and give more importance to international law, rather than power politics,” said Putin. Does Ukraine have an alternative to Gazprom? A video question was sent to the Russian leader from the former U.S. intelligence agent Edward Snowden, who exposed the U.S. government’s across-the-board surveillance on all its citizens. The American was interested whether the Russian Federation also carries out such surveillance. Putin said that a mass surveillance of the population, as it is done in the U.S., is impossible in Russia. The president said the use of special equipment by Russian special services, including wiretaps and surveillance on the Internet is strictly regulated by law. In particular, it is necessary to first obtain a relevant court order. “Such a massive scale, uncontrolled scale, we certainly do not allow. And I hope we will never allow,” Putin said.